PMC ammo is manufactured in South Korea by a top defense contractor. These 7.62x39mm rounds would be just at home on the other side of the Korean Peninsula, but instead they have come to the US and will make an excellent load for your SKS or AK rifle. 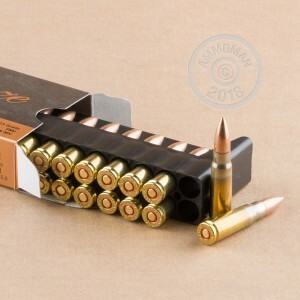 Packaged in a case of 500 cartridges, this ammunition differs from many other 7.62x39mm imports in that it uses non-corrosive Boxer primers (instead of the usual Berdan primers) and reloadable brass cases. If you want to squeeze a little more reliability out of your rifle, these rounds might be your best bet. 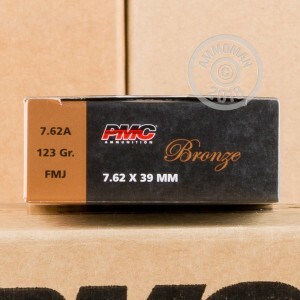 Unlike some Eastern European ammunition, PMC's 123 grain full metal jacket bullet is NOT a bimetal round, does not have magnetic properties, and should be suitable for any range that can accomodate rifles. This is an important advantage if you plan to shoot indoors! AmmoMan.com rewards its volume customers handsomely with great case prices and FREE shipping for any order over $99. Buy in bulk and save! Worked without a hitch in my AR 7.62x39. Buying brass is Expensive but worth it for my AR. Saving my metal casings for my AK. This is the ammo to use. Yes, it's expensive. However I feel this ammo is how you show your rifles you love them. Using this ammo in my arsenal sam7sf and Yugo sks. I will continue to buy. 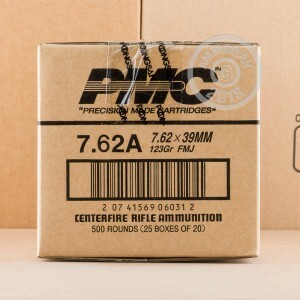 Shipping included at ammo man is ultimately the best price per round online. This site is now my primary bulk source.